Glasgow Libraries, Past and Present. March sees the arrival of the annual Aye Write! book festival in Glasgow, based at the Mitchell Library at Charing Cross. Glasgow City Council manages 32 libraries across the city in addition to the Mitchell Library. At times of falling council budgets across Scotland the libraries often seem to be a soft option for cuts with shortened opening hours, library closures (such as sixteen recently announced library closures in Fife) and job losses. Freedom of information requests have also revealed less obvious cuts taking place with councils across the country cutting their expenditure on new books in recent years. If the books are not kept fresh and replaced the appeal of the library falls. However libraries have for many years now been about more than just lending books. For many people the local library can be their only way to access the internet. Libraries offer DVD and music loans, ebook downloads, local history information, newspapers and magazines, book groups, toddler activities and other social functions. Each of the Glasgow libraries also offers MacMillan cancer support and information services now. All of these activities are important in combating social exclusion for many people. Even just having somewhere warm and dry to sit for a bit out of the house, without having to pay money to anyone, is as good a reason as any to maintain public libraries in communities across the city. I was thinking about this recently when I went walking about in Possil. When I worked in the area a few years ago I used to sit in the library there quite often, browsing the shelves or flicking through a magazine at lunchtime. As a child I was never away from the library, wherever we were staying in Glasgow. For me Whiteinch and Maryhill libraries were the ones that I knew my way around as a child and still have a clear mental image of their layout. When I was a bit older I used to go to Knightswood Library every week with my brother after going swimming. We would go and see my auntie Isobel on the way to the library, pick up her books and swap them for some new ones we chose for her (she had a soft spot for Tintin and Lucky Luke). When studying for my Highers I took it upon myself to get the bus into town after school once a week and I would sit in one of the big reading rooms in the Mitchell Library to catch up on my homework with some peace and quiet. Whilst there I would get distracted, wandering off into the Glasgow Room. I would pore over old directories and maps or look up famous events in the microfiche of the Glasgow Herald and Daily Record (this was in the days before things like this could be found on the internet). Getting to know my way around their archives I have subsequently been back there many times doing family history research. Since my own children have come along again I have spent many days entertaining them in Partick and Hillhead libraries, introducing them to new books and new authors, and as they got older seeing what else takes their fancy in the adult section. I have used all these libraries for years without really paying them much attention, but I know that I would notice if they were no longer there. So I thought I would try to have a look around some of them (though not all thirty-three). 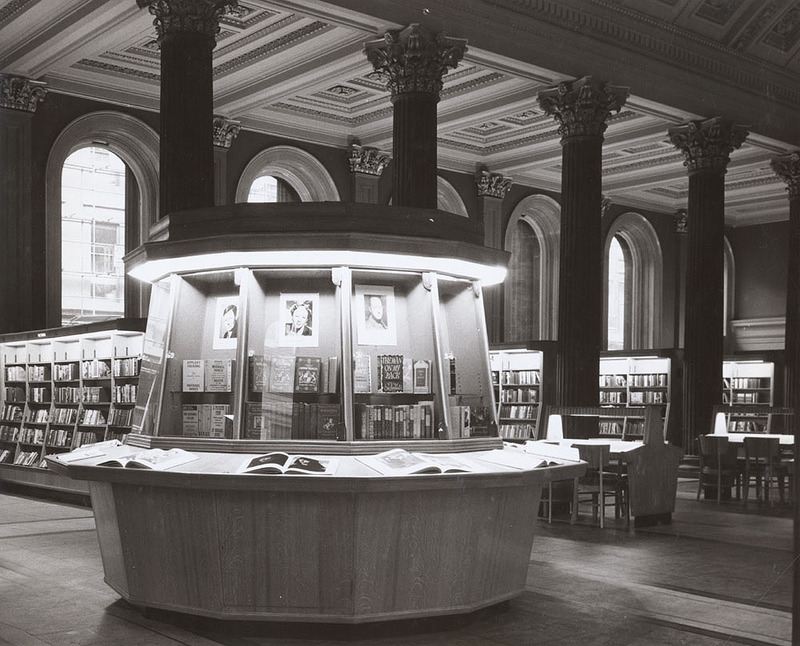 A brief history of Glasgow's public libraries. In 1898 Glasgow Corporation wanted to expand the centralised library resources it held. A year later an addendum to the 1899 Corporation Tramways and General Purposes Act gave them the power to move forward with their plan. It allowed the corporation to levy ratepayers one penny (1d) in the pound to establish free public libraries, to buy books and maps, and to maintain the libraries. In doing this they created most of the libraries familiar to us in the city today. At this time Glasgow Corporation operated the Stirling Library and the Mitchell Library (which in 1898 was located in Miller Street). Stirling's Library was funded by a bequest from Glasgow merchant Walter Humphrey Stirling (known as "Humphy Watty" because of a deformity of his spine). When he died unmarried in 1791 he left his 804 books, his house in Miller Street and £1000 to establish a free library. Initially located in his former home on Miller Street, it soon moved to another building on the same street. Initially the books were for reference only and available only to subscribers. By 1885 the collection had been added to by further donations and amounted to 50,000 volumes. At that time an annual subscription to the library cost 10s. 6d. As the book collection grew it moved to different locations in the city, including sites at St Enoch Square and in Hutchesons Hospital. There were other subscription libraries within Glasgow, and in the surrounding burghs which were not yet part of the city. These included a library in Maryhill established by the owner of Dawsholm Paper Mill, one in Pollokshaws set up in 1844 by the then Provost and a reading room in the Pearce Institute in Govan. In the 1880s there were also notable subscription reading rooms in Trongate at the Glasgow Central Working Men's Club and Institute, and the Bridgeton Working Men's Club and Reading Room which had a 5s. annual subscription. For this you had access to 2000 volumes, newspapers, periodicals and other distractions such as chess and draughts. The stated aim of these facilities was the "promotion of the social, moral and intellectual welfare and recreation of the industrial classes". The "Glasgow Public Library" was another subscription library on the go in the city, established in 1804. In 1871 Stirling's Library merged with this to form "Stirling's and Glasgow Public Library". This was three years before the death of tobacco manufacturer Stephen Mitchell, who bequeathed money to establish a new public reference library, which took his name (see below). 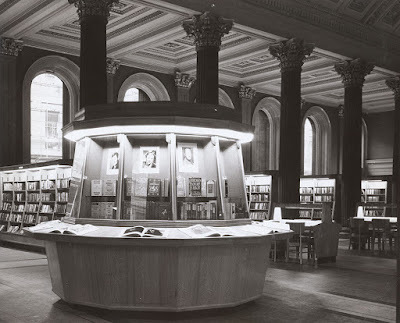 In 1954 Stirling Library took up the main hall at the Royal Exchange building on Queen Street, with "The Commercial Library", formed in 1916, occupying the basement. The Commercial Library met the information needs of local industry and commerce. The Stirling Library stayed here for 40 years, before being moved back to Miller Street whilst this building was converted into the Gallery of Modern Art. The basement here was initially used as gallery space when GoMA opened in 1996, but in 2002 Stirling Library was moved back into this space in the Royal Exchange building, becoming the clumsily named "Library at GoMA". "Let Glasgow flourish, so say we all of us Scotsmen throughout the world." Sixteen libraries were eventually built, which varied in size and content depending on the area in which they were located. The complete scheme, including buying the sites, construction of the buildings and purchase of the books and periodicals cost £337,480. Although they are generally called the Carnegie libraries, with further smaller donations Carnegie's contribution was a third of this money. By the late 19th century Andrew Carnegie had made his fortune in the American steel industry. His was the archetypal story of the American dream, a poor immigrant arriving with nothing and rising to make his millions. Born in Dunfermline, he emigrated to the USA as a child with his parents in 1848. The family set sail for America from the Broomielaw in Glasgow. In his later years he became renowned as a philanthropist, reportedly giving away 90% of his fortune. Some of his earliest gifts went to create splendid swimming baths and a free library in his old home town of Dunfermline. He established university departments, medical facilities and educational scholarships. At this time there were few free public libraries and as a strong believer in their merits he funded over 2000 free public libraries around the world. In Glasgow his 1901 donation is associated with the construction of seven of the most impressive of the city's new libraries. These were designed by Inverness architect James R Rhind. Rhind had been working in Montreal for several years and many of his designs included elaborate baroque arches, columns and sculpture which are thought to derive from the French influenced buildings he saw there. Some of these libraries are still among the city's most handsome buildings. Rhind designed the libraries at Bridgeton, Dennistoun, Govanhill (Govan and Crosshill) , Hutchesontown, Maryhill, Woodside and Parkhead. Townhead Library, Glasgow. Now demolished. Of the original libraries Anderston Library on MacIntyre Street was the first to be demolished, making way for the M8 motorway in 1968. Townhead Library on Castle Street (pictured above) was demolished more recently, in 1998. The statues from this building were sold to an American businessman, Addison Kimball of Illinois, for £12,500. Dennistoun Library in the city's east end was built in 1905 in yellow sandstone. 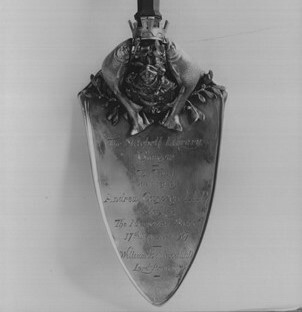 A bronze figure stands on top of its dome, with an open book resting on her arms. This sculpture and the female figures carved into the arch above a window are attributed to William Kelloch Brown. Brown is responsible for much of the sculpture on the Rhind designed libraries. He trained at the Glasgow School of Art, before winning a scholarship to London. Whilst there he constructed the balconies of the Savoy Hotel. He returned to Glasgow and taught at the Glasgow School of Art. From its opening Dennistoun offered newspapers as well as books to its readers, laid out on a wall at one end of the reading room. Their inclusion was controversial with some feeling that they were trivial, took up too much space and would attract "unsavoury loafers" to the library and deter others from coming. Other people spoke of the potential advantages of newspapers in libraries. They believed that newspapers would draw people to the library who would then progress to reading books, that they would deter people from going to nearby public houses instead and would allow them to keep informed and find job adverts. 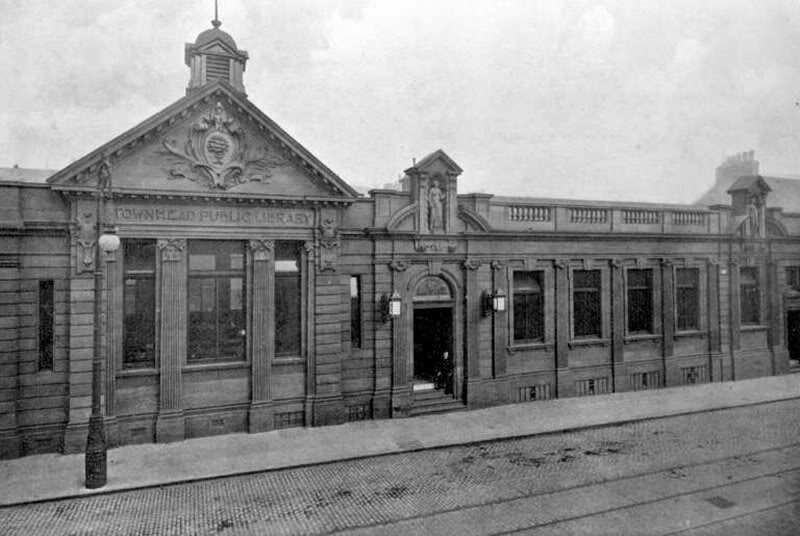 Parkhead Library opened in 1906, on Tollcross Road next door to the public baths and washhouse. The same bronze figure can be seen atop the dome here as at Dennistoun Library, still reading her book. More elaborate sculptures by William Kelloch Brown stand above the entrance, looking like a family group. Govanhill Library was opened as Govan and Crosshill District Library in 1906 at the junction of Langside Road and Calder Street. A single storey building, again richly decorated with sculptures of figures holding books and laurel branches on the Calder Street side similar to the sculptures above the doors at Woodside and Maryhill Libraries. A bronze, winged angel balances on one leg on top of the dome here. In 1995 she was stolen by four men who pretended to be workmen taking it away for renovation. It was recovered by the police and returned to its rightful place. The Glasgow psychiatrist RD Laing grew up in Govanhill in the 1930s and wrote about this sculpture in his autobiography. "My life saving consolations were moonlight and gaslight, the angel on the dome of the library..."
"...very imbued with books. Right outside my bedroom window was the dome of a public library on top of which was an angel, poised on one foot as though to take off to the moon and the stars." Before becoming part of Glasgow, Maryhill had a free public library since 1823. It was financed from fees for lectures and contributions from the owners of the Dawsholm Paper Mill and local gentry. Maryhill Library where it stands today on Maryhill Road (formerly Wyndford Street) was opened in 1905. Built in yellow sandstone on a narrow site it has two stories and a basement. It had separate adult and children's entrances and separate reading rooms for men and ladies. This library I can remember visiting often in the 1970s, when the newspapers were laid out along one wall, with a large wooden pole holding the newspaper together, and presumably preventing anyone taking it home with them. As at Parkhead it was near the washhouse or "steamie", which used to lie across the other side of Maryhill Road from here. At the time of writing this the library is temporarily closed for repairs to its roof. Woodside Library is not a million miles away from here, on St Georges Road. Also opened in 1905 it is a handsome, single storey building with round-headed windows, Ionic columns and more sculpture attributed to William Kelloch Brown. At the top of the building stands a sculpture of a woman holding a book with a couple of youths at her feet. Dressed as she is in teacherly robes, she is obviously imparting knowledge from its pages to this pair. Three naked females are depicted below this sculpture, reclining on piles of books, infants at their feet. The building which currently houses Bridgeton Library, right at Bridgeton Cross, was previously the Olympia cinema and music hall. With this in mind the library is home to what is described as "Scotland's first BFI mediatheque". As well as all the usual library services it has an archive of British Film Institute material which can be watched in various booths in the building. This includes old films and television programmes, documentaries, public health films and old adverts. An imaginative use of an old building. However just around the corner from here lies the former Bridgeton Library building. This was the first of the James R. Rhind designed libraries to open in Glasgow in 1903. The one time Bridgeton District Library on Landressy Street, has recently found a new use as home to the Glasgow Women's Library. This recent newspaper article describes the 25 year history of this venture, which now has a beautifully renovated building to house its archive and events. At risk of falling into dereliction the building now has been saved and has a role in celebrating the achievements of women of Scotland. Opened in May 1906 the building follows the concave curve of the street. A new facade on the southern end features titles from the Women's Library collection. On the original building allegorical figures, attributed to the sculptor William Kelloch Brown, represent learning, industry, art and commerce. As usual, books are prominent in the sculptures. "The general impression given by the reading rooms visited was that they were all overcrowded with young men of the labouring class during the day, a most surprising circumstance considering the prosperity of the city and the amount of work going on. Bridgeton especially attracts a rough type of Irish reader, and spitting assumes am epidemic form both there and elsewhere." Hutchesontown District Library was the last Glasgow library designed by James R. Rhind and his grandest and most decorative. It opened in November 1906 on McNeil Street with a stock of 9,600 books, added to by donors over the years. With slum clearance in the area coming on apace it was closed in 1964, but thankfully spared the wrecking ball. It is currently home to an after school club and offices. On Hutchesontown Library the bronze winged figure holding a book looks to be cast from the same mould by William Kellock Brown as those on several other of the libraries he was involved with. The other sculpture work above the door is of a square jawed St Mungo flanked by six female figures holding emblems from the Glasgow coat of arms, all very handsome. Gorbals Library on Main Street opened in 1907, in two upper floors of the Gorbals baths building. It was replaced by a new Gorbals Library on Norfolk Street in 1933 which closed in 1986. As attempts are made to re-generate the Gorbals area a new library was opened on Crown Street in 2004, a rather functional building by comparison with what went before. Langside Library was designed by George Simpson, who also designed Possilpark Library. It opened in 1915. It is noteworthy as the first Glasgow library to let you chose your own books from the shelves instead of requesting them at a counter. 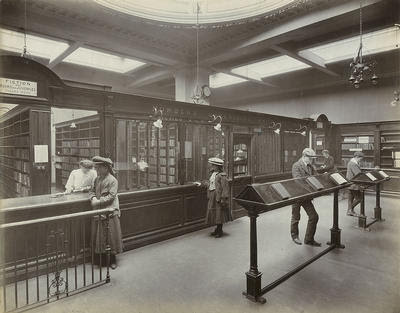 As you can see from this 1907 picture below, readers chose a book from the catalogues laid out for them to look through and requested it at the counter. They could then take it home or to the reading rooms. This lies at the site of the Battle of Langside, where Mary, Queen of Scots fought Moray. 300 men died in a battle which lasted less than an hour. This is commemorated on a wall outside of the library and with a large painting on one wall inside the library within the children's section, a section which has recently suffered water damage after some lead was stolen from its roof. 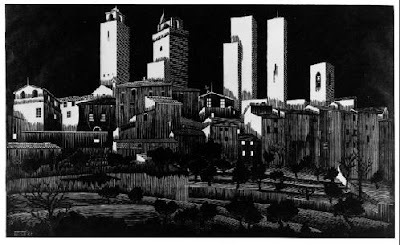 The painting was designed by Maurice Greiffenhagen and painted with the assistance of students from the Glasgow School of Art. Pollokshields Library stands on Leslie Street and because of the needs of its local community also stocks books and magazines in Urdu. It opened in 1907. If it seems a bit more bland than some of the other libraries, that may be a result of it being one of only two of the libraries built at this time being designed in-house by the City Corporation's Office of Public Works. Carved plaques at the front commend "History" and "The Arts" to us, whilst a modern sign advises us that this is no place to hang about. "We are citizens of no mean city". Although the term "no mean city" is now associated with the Gorbals set novel of 1935, the Lord Provost was not the source of it. The phrase itself is actually from the new testament, how Paul the Apostle describes the city of Tarsus. No longer a library the building still stands despite a serious fire destroying the tenement that abutted it in 2010, used at present by a charity for the homeless. The name of this Clydeside area, Kingston, of course harks back to the trade Glasgow used to do with the Caribbean colonies. The library in Cathcart is based in a hall of The Couper Institute on Clarkston Road. Robert Couper's family ran the Millholm Paper Mills on the banks of the White Cart Water. The halls were built in 1887 from a bequest he left and built by architect James Sellars. He was born in the Gorbals in 1843 and also designed the Stewart Memorial Fountain in Kelvingrove Park and the Victoria Infirmary building. Originally there was a library hall to the left of the Couper Institute, but it was re-modelled and built as an extension on the opposite side of the building in 1923. Elder Park Library in Govan is one of the most distinctive in the city. It's location, standing alone just inside Elder Park helps too. Both the park and the library take their name from Isabella Elder, widow of John Elder, who took over and grew the Govan shipyard that took his name in the 19th century. When he died in 1869, as his heir she successfully took over the running of the business for nine months before transferring ownership to a partnership led by her brother. With no children herself, over the next 35 years of her life she donated much of her money to causes close to her heart. She bought North Park House on Queen Margaret Drive (which later became the BBC building) and, at a time when women were not admitted to any Scottish universities, gave it to the Association for the Higher Education of Women to establish Queen Margaret College. Also on this site she funded a medical school. In 1883 she bought land near to Elder's Fairfield Shipyard and established Elder Park to commemorate her husband. In 1901 she provided £10,000 to build a free library in the park and a further £17,000 to buy books and to maintain the library. One condition that she laid down was that the library must open on Sundays. In 1903 she attended the opening ceremony, alongside Andrew Carnegie. Designed by J.J. Burnet, whereas many of the libraries have scrolls withe "arts", "history" or sculptures representing "geography" on them, this building has the rare site of "science" carved into its wall with pride. Above the entrance there is a sculpture of the Govan coat of arms, a shield with a ship on the stocks, a carpenter and an engineer standing on either side of it. Govan and this library was clearly a place for the working man. The Govan motto is at it's base "Nihil sine labore" ("Nothing without work"). "Shortly after four o'clock hundreds of children were on the scene and the commissioner who was in attendance had great difficulty keeping the children in order. They swarmed round the door like bees round a hive"
Partick Burgh Council, not yet part of Glasgow until 1912, turned down Carnegie''s 1901 offer of £10,000 to build their own library as they did not wish to impose the one penny in the pound tax on their ratepayers to fund the books and maintenance. In 1925 Partick Library was opened, designed, like Whiteinch Library, by Thomas Somers of the city engineer's department. To make Partick know whose town they lived in now, the Glasgow coat of arms is prominent by the entrance. Whiteinch Library opened in 1926, lies across the road from the grand, and increasingly derelict Whiteinch Burgh Hall. The housing estates built in Glasgow after the First World War had to wait a while to get their own libraries. This was not helped by the economic depression of the inter-war years. 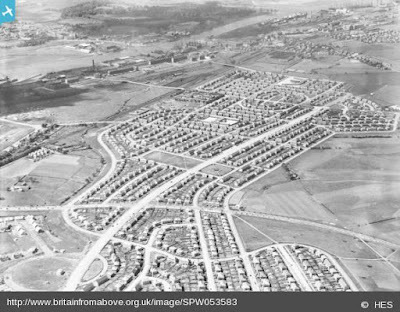 Riddrie housing estate, like Mosspark and Knightswood, was built between 1920 and 1927 and it was the first of the outlying estates to get its own purpose built library. As I had a granny living in Mosspark and as a teenager lived in Knightswood, cycling around Riddrie today is just like being back home, apart from the massive prison overlooking it all. Other areas had to make do with temporary accommodation in schools and other buildings. Riddrie Library, on Cumbernauld Road, is a handsome brick building. Mosspark and Knightswood housing estates were built at the same time. 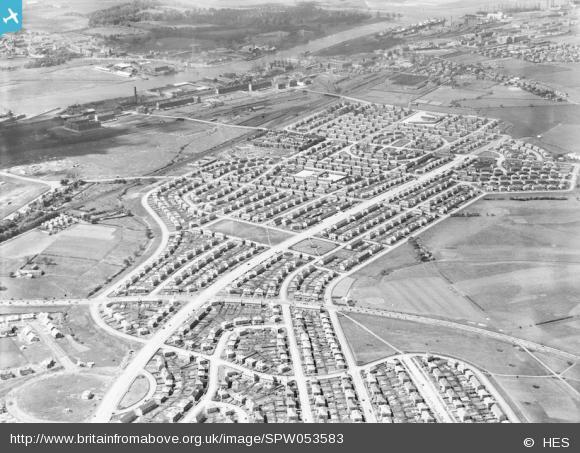 This 1937 photograph of Knightswood from the air (from the fabulous and addictive Britain From Above website) has Alderman Road sweeping up the picture from the bottom left corner. The empty rectangle of grass in the middle was due to be developed into an ambitious community centre in 1939 but the plans were put on ice because of the war. It was not until 1950 that a small part of the planned community centre was completed, facing Dykebar Road, and this is where Knightswood Library was established that year. It was 1971 before the rest of the community centre including a swimming pool and new, enlarged library building was completed. The building may not quite have the same aesthetic appeal as earlier libraries but it was/ is well used. In 1973-74 it had the third highest amount of books issued after Cardonald and Partick libraries. This was about to be overtaken in popularity by a new library serving the population in the Byres Road area. In 1907 Carnegie had put up the money to build a library in Hillhead but plans were shelved for lack of an appropriate site. When Hillhead Burgh Halls were demolished in 1970 a site became available. After decades of campaigning Hillhead Library opened in 1975 and it immediately became the most popular library in the city, in terms of books issued. It has maintained this position ever since. Although some of the newer buildings have not stood the test of time, such as the one which Drumchapel Library is lumbered with, honorable mentions must go to some of the more recent additions to Glasgow's library portfolio such as at The Bridge in Easterhouse and the new libraries in Pollok and Milton. Okay. We are in the home straight now. Two more and then I will shut up. So I am cheating now by including this academic library, as it is open to University of Glasgow students and not a public library, but I spent so many days here as a student that I felt that I had to include it. Visitors can get a one day pass if they wish to browse through the 2.5 million books and journals the university library holds. It also has special collections including 10,000 books printed before 1601. The university library is first mentioned in 1475 and after the university moved to its current Gilmorehill site, the library occupied the attractive part of the main Gilbert Scott building, where the Hunterian Museum currently sits, for about 100 years. By the 1930s the need to expand the library and the university campus led to the construction of the GUU building and a new library. 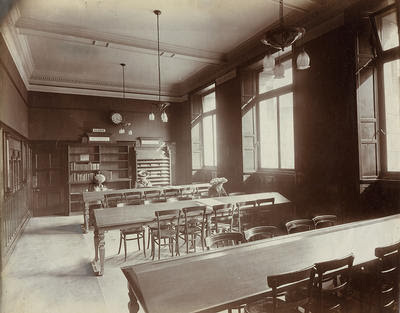 In 1939 the circular Reading Room opened to house the old Department Class libraries as they were moved out of departments. Briefly in the early 1990s it housed the short loan collection. I used to spend a lot of time in here studying, just because it was such a bright, airy building, with light all around you and the old fashioned balcony looking down into the main hall from above. As the need for more library space grew, the current 12 storey library was constructed in 1968 and the main university library collection moved over from the Gilbert Scott building. Its brutalist, concrete design has been softened a bit in recent years by its new cladding but I always liked the idea that it was meant to evoke a medieval castle keep or the town of San Gimignano as pictured by MC Escher. As I said at the beginning, my love for the Mitchell Library goes back to my days in fifth year at school when I came here to do my homework. A few years before that my dad used to work here as a librarian for a bit just after leaving school. The current building on North Street, overlooking the M8 at Charing Cross opened in 1911. Never one to miss a photo opportunity with a library, Andrew Carnegie was on hand to lay the foundation stone with a commemorative trowel, despite not being responsible for funding it. "The admission is free, and no introduction or guarantee is required. 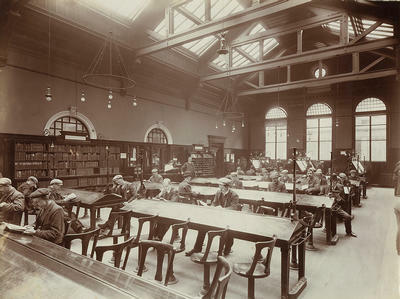 The scene presented by the library is somewhat striking; sitting reading side by side may be seen well-dressed gentlemen, plainly-attired working men, and squalid ragged-looking urchins from the East End, all on the same level and with equal rights and privileges in the stores of knowledge. The only request that is made is for clean hands - not a high price for the value of the commodity supplied"
In 1891 it moved to larger premises on Miller Street and again was soon outgrowing its accommodation. In 1911 the current building was opened to the public. It was extended in 1953 and when fire destroyed the famous St Andrew's Halls behind it in 1962 the library was able to further extend backwards into that space, alongside the newly constructed Mitchell Theatre. One of Europe's largest public reference libraries it also houses the city archives, rare books, manuscripts, newspaper archives, legal archives, some of Robert Burns's manuscripts and photographic archives. If you can't find an interesting way to waste an afternoon in here you really aren't trying hard enough. Just go and browse through a collection of over a hundred years worth of the National Geographic magazine, which sits on the shelves along the wall of one of the reading rooms. The sculpture above the old main entrance is meant to represent "Wisdom" sat on a throne, laurel wreath in her hair and opened scroll on her lap. Above the copper clad dome "Literature" strides forwards towards the future, another scroll in her right hand. Close Up of Sculpture of "Literature"
It is hard to imagine what this area looked like when the library faced the other side of North Street instead of a sunken motorway. It feels a bit cut off here, amongst the noise of the traffic. However 50 years after the motorway cut a hole through many close-knit Glasgow communities there are plans being floated to cover over the motorway with a garden park, to reconnect the Mitchell Library with the city. Returning to Glasgow along the M8 after dark, the floodlit library building is a distinctive reminder that you are home. Like all the libraries above, they can easily be taken for granted, so make sure that we use them and make sure the city continues to look after them. Great piece, Paul. Burnet's library in Elder Park is quite stunning. One correction on the University Reading Room, which never housed the University Library main collection but did house the old Department Class libraries as they were moved out of departments and briefly the Short Loan Collection in the early 90s. The main collection moved over in 1968 from the Gilbert Scott Building (the person who helped supervise it still works on a voluntary basis in Special Collections on the manuscript collections). You can see the building going up and the move in this article. Thanks for this piece. The quality of Glasgow's public library buildings shines through. Here's hoping the Jags break their 21? year run tomorrow and win. Thanks for that, I've amended the main text. As for your last point, it feels long overdue. This is fabulous! I know many of these libraries (I'm a retired librarian and volunteer with the Women's Library) and feel inspired to seek out some of the others. I also read your Maryhill article - I volunteer with the Burgh Halls too, as a tour guide amongst other things. They have recently set up a heritage group and I'm sure your insight and knowledge would be really valuable.